Zebra’s best-in-class Z Series printers just got better! The ZM400 includes additional productivity-enhancing features and modern, flexible network connectivity for easy system integration in most manufacturing, warehousing and business applications. This industrial/commercial workhorse also delivers efficient 4-inch-wide labelling thanks to its quick throughput and 10 inches-per-second print speed. This is by far our most popular Zebra printer which replaces the Z4M. If you are looking for a printer that can meet your growing demands at an affordable price this is a great option to consider. If your Zebra printer does turn on and you have problems printing the first place to start is the Zebra User Manual. Click on the 'User Manual' link above and search the PDF document. 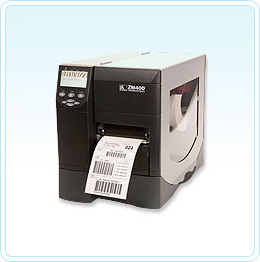 If your Zebra label printer will not turn on and you have checked that the power point does work, then your printer probably has a blown power supply or damaged main board and will need to be returned to our service centre for repair.